This cake was made using the Wilton lion cake pan. The pre-formed friendly lion pan had deep enough groves that the details were able to be seen after the cake was cooked. After the cake was cooked I cut off the bottom making the cake level and flat for icing (you want to level your cake to prevent cracking). 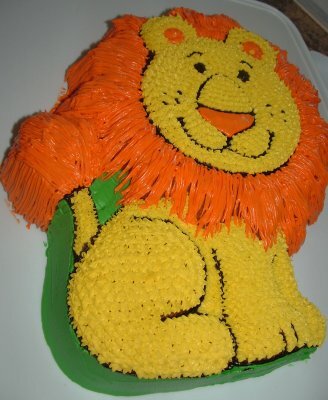 I used green around the bottom of the cake to look like a grass or like the lion was in a natural setting. I applied the green icing using tip #47. I then used a #3 tip to make all the black lines on the lion and also used this for the nose and eyes. To make the black icing always start with chocolate icing and then tint it black. It uses far less tint color and also tastes better. Next, I mixed a yellow icing for the lion cake and applied the icing using tip # 16. For my finishing touch I made the orange icing for the mane. I used a really fun tip – I used tip # 233. Tip #233 is fantastic for hair, grass, etc. This tip made the lion birthday cake come alive and looked unbelievable. 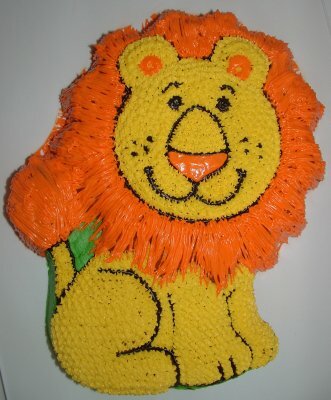 This unbelievable lion was easy to bake using the friendly cake pan; and super fast and easy to ice. Icing that looks like real hair really make a ‘roaring’ statement at any party. Enjoy!